The picture book is a form of illustrated literature popularized in the twentieth century. 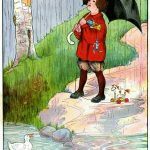 Although the illustrations can use a range of media from oil painting to collage to quilting, they are most commonly watercolor or pencil drawings. 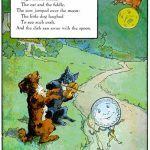 Picture books are for young children, and while some may have very basic language, most are written with vocabulary a child can understand but not necessarily read. For this reason, picture books tend to have two functions in the lives of children: they are first read to young children by adults, and then children read them themselves once they begin to learn to read. 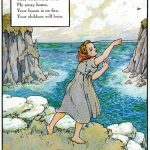 The precursors of the modern picture book were illustrated books of rhymes and short stories produced by English illustrators Randolph Caldecott, Walter Crane, and Kate Greenaway in the late nineteenth century. These had a larger proportion of pictures to words than earlier books, and many of their pictures were in color. The first book with a more modern format was Beatrix Potter‘s “The Tale of Peter Rabbit“, ordinally published in 1902. The Caldecott Medal, named for illustrator Randolph Caldecott, is given each year by the American Library association to the illustrator of the best American picture book of that year.